If you are looking for a qualified dentist in the O'Fallon area and the surrounding communities of St. Louis to perform your dental implant restorations, you can trust Dr. Sarah Thompson of Soft Touch Dentistry. With over 10 years of private practice experience, she can deliver unmatched expertise when it comes to cosmetic dental services such as dental implant restorations. We are a full-service family dental practice that is equipped to handle the health and beauty of your smile through any stage of life. Our goal is to serve patients with state-of-the-art dental care in a caring, stress-free environment. Dr. Thompson and our team of dental support professionals make up a dedicated team who is passionate about helping you achieve your smile goals. As an excellent implant restoration dentist, Dr. Thompson can both repair your dental implant and provide the crown, bridge or partial denture that you need to be placed over your dental implants. We value your choice to have dental implants, as it is the gold standard treatment option for missing teeth. 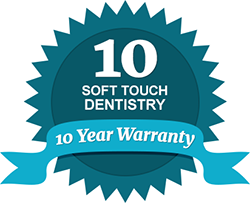 At Soft Touch Dentistry, we work hard to ensure your dental implants are finalized to create a smile that looks, feels and functions like your natural teeth. If you are experiencing problems, we can help you with dental implant repairs and other restorative procedures. At Soft Touch Dentistry, we offer free second opinions for patients who are concerned about their previous dental care. You will find that our practice takes extra measures to ensure our patients are well informed and comfortable at all times. We offer relaxing amenities, chair side patient education videos and sedation dentistry services. Dr. Thompson is among the few dentists that are licensed to perform IV Sedation during dental procedures if needed. If you live or work in the O'Fallon or surrounding St. Louis areas and are in need of dental implant repairs or restorations, Soft Touch Dentistry is the right choice. Our practice is currently accepting new patients and we would appreciate the opportunity to care for you and your family. We work with many dental insurance providers and offer accommodating financing plans to help you afford the dental care you need or desire. Contact us today and discover the difference we can make in your smile.